Japanese style tea bowl. 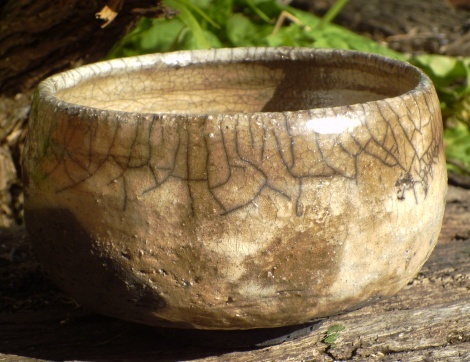 Raku fired bowls are only suitable for drinking matcha or powdered green tea as Other uses may have many acidic foods that can react with the pottery. Fired to 1000 degrees C. and placed in a reducing atmosphere to get some metallic effects inside. Crackling in the white glaze is typical of raku fired wares. 170 mm diameter 90 mm high.